Despite the increase in digital transformation adoption, many businesses are still struggling to translate strategy into success. The concept of digital transformation has itself seen a transformation in a few short years. When it emerged, it was dismissed as a buzzword or a fad - a fanciful idea that could never truly be realised. 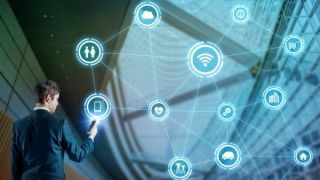 However, business leaders are finally understanding and implementing the fluid and adaptable strategy; 79 per cent said that digital transformation is now a strategic priority (Vodafone). Digital transformation was an intimidating concept to small businesses as it connoted an expensive, time-intensive process that they simply couldn’t afford. However, as Forrester notes, it’s now widely recognised that digital transformation incorporates granular, incremental changes to operations that contribute to improving a business’ performance and feed into a wider transformational strategy. Despite the increase in digital transformation adoption, many businesses are still struggling to translate strategy into success – a Couchbase study found 9 out of 10 digital transformation projects fail. So, whilst it’s encouraging that businesses are embracing transformation through technology, it’s evident that these strategies and projects aren’t being approached in the right way. Unsuccessful transformational projects can happen for a multitude of reasons, as there are a number of factors that can contribute to the failed execution of your strategy. A Wipro Digital survey found that 35 per cent of digital transformation efforts fail because of a lack of a clearly-defined strategy. Whilst it’s key for leaders to recognise that digital transformation doesn’t necessarily mean a complete overhaul of their business’ technologies and processes, it must be a clearly-defined strategy with distinct goals and outcomes. One of the misconceptions the technology industry has been fighting for years is the notion that digital transformation is all about implementing the latest innovative technologies. And while innovation and modernisation are key tenants of business transformation, this is a one-dimensional view. Often, the most successful transformational projects involve moving away from a legacy system that is impossible to manage, upgrade or integrate with other solutions. Old, clunky technologies overwhelmingly hold businesses back because of these reasons. Often, they’re clung onto because they hold business-critical data, but this results in them sitting in isolation as other business systems are upgraded or implemented. The older a system gets, the more likely it is to fall out of mainstream support and therefore the more security risks it poses. In turn, this increases the cost to upgrade or move away from the legacy system, resulting in businesses continuing to operate on them way past their expiry dates. However, at the opposite end of the scale are the businesses that implement technologies simply because they’re the brightest and the best, without evaluating what they’ll bring to the table. If you’re a services business, augmented reality technologies probably aren’t going to bring you many benefits. But for a furniture or clothing manufacturer, that type of technology can be a game-changer. It’s also important to remember that innovation can come in surprising packages. Many businesses are reliant on ERP and CRM technologies to manage financials and customer data, and the systems are considered to be business-critical but boring. With new innovations like artificial intelligence and stronger integrations between disparate systems, however, these solutions now have the power to be transformative rather than restrictive. The granular, incremental changes that you will roll out as part of your digital transformation efforts must stem from a well-defined strategy. And because strategy comes from the upper echelons of your business, you need to ensure not only that they’re driving that strategy, but that they’re fully bought into it. Multiple surveys suggest that, while business leaders are looking to prioritise digital transformation, they’re not confident in their ability, or their business’ ability, to do so. Many leaders lack confidence in their own digital skills (Deloitte) or the skills of their people. For digital transformation projects to be truly successful, IT representation is required at the highest level in a business. Young, savvy start-ups are likely to be led by digitally-literate executives, but for those who aren’t confident in their own skills, an IT representative is essential. As the department that likely owns a business’ many technologies, IT holds the key to getting the most out of those technologies, spotting areas of weakness and identifying systems that must be improved. Additionally, for businesses who don’t have an in-house IT department or for those who outsource, a managed service provider can be an invaluable tool in devising a digital strategy. For MSPs and IT service providers, digital transformation is their bread and butter. These organisations live and breathe business technology and are expertly-placed to identify the solutions, or strategic changes, required. Sometimes, the departments that could benefit the most from digital transformation efforts are the most likely to be averse to it. An Oracle study into the barriers businesses face when moving to the cloud discovered that finance and HR departments are the most resistant to change, as well as the most likely to implement shadow IT purchases that are difficult to manage and integrate. The latter is one of the many reasons that IT should be at the heart of driving your digital strategy - to prevent the implementation of shadow IT purchases that don’t integrate with other systems or aren’t the most suitable solution. But it’s important to understand why resistance comes from these departments, as well as others. A reluctance to embrace digital change from the wider business is an incredibly common barrier, evidenced in multiple studies from the likes of Harvey Nash, IFS and Futurum. This resistance, again, can’t be pinned on a single cause. Often, employees get comfortable with the systems that they know and have worked with for years. If you dig deeper into this, it often boils down to insecurities around digital skills. It’s well-established that the UK is experiencing a digital skills gap that, if left unaddressed, could spell disaster for a future economy where over 80 per cent of jobs don’t currently exist (World Economic Forum). Consulting with your employees is an important step in your digital strategy. By tearing apart the systems they know and work with every day without understanding their needs won’t do you any favours. A key tenant of digital transformation is how it can transform the way your people work, eliminating manual or repetitive, time-consuming tasks so they can focus on adding value. By presenting your strategy in this way, you’re sure to win over even the most hardened technophobes. A whopping 95 per cent of respondents to the Couchbase survey said that the ultimate aim of digital transformation efforts should be “to give customers and end-users a truly unique experience.” Because what’s the point in making your staff more productive or your business more efficient if that has no impact on your customers? It’s widely accepted that most digital transformation efforts should ultimately have an improved customer experience as the end goal. Customer service can make or break a business relationship; 70 per cent of organisations that move supplier do so because of poor customer service from their previous partner (Accenture). Digital transformation can bring about almost any change you want to see in your business. You can make significant cost-savings by eliminating redundant technologies and processes, increase your profits by improving or increasing your products or services through technological changes, or better understand the pain points of your industry and use data to drive better insights. But without taking the customer experience into account, you’re setting your business up for failure. When faced with a multitude of challenges and damning statistics about the success of digital transformation projects, it can feel daunting to begin your business’ own digital journey. But a number of these issues can be combatted with the same solution: a well-considered, strategic approach to transformation is the key to success. Businesses fail because they jump headfirst into digital transformation without a strategic goal, consideration for their employees or their customers. By understanding why you’re turning to digital transformation as a strategy in the first place means you won’t waste valuable time or resources on solutions that won’t work for your business.